Just a short post today because I am exhausted from working at my employer's user conference the last three days. Being pleasant and helpful and chatty for that many hours a day was quite tiring for me; I do much better holed up in my office typing code all day. By tomorrow perhaps I will have recovered enough to sort out and process the display photos I didn't get to last week. 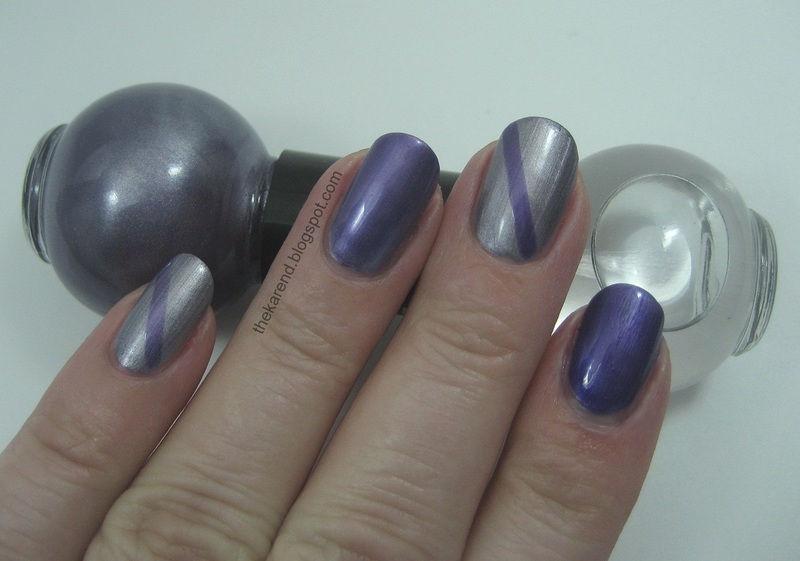 You may remember the Color Phase dumbbell bottles from my last display post; today I've got swatches of the one I bought to try, a silvery lilac that has no name that I could find looking at the bottle (I did find these are from Styli Style). The colored polish was quite opaque, a tad brushstrokey, and more silver than I thought it would be based on looking at it in the bottle. The clear top coat on the other end turned the color into a much brighter lilac and softened the appearance of the brushstrokes. The brush in the color end is a normal polish brush; the one in the top coat end is much more skinny, along the lines of a nail art brush, which made it easy to make stripes on two of my nails. If you think the bright lilac on my index finger doesn't look the same as on the other nails, you're right. On that nail, I used OPI RapidDry top coat, and the color still changed. So the magic here is in the color, not the clear. That opens up the possibility of having more fun experimenting, but also means using top coat is right out. 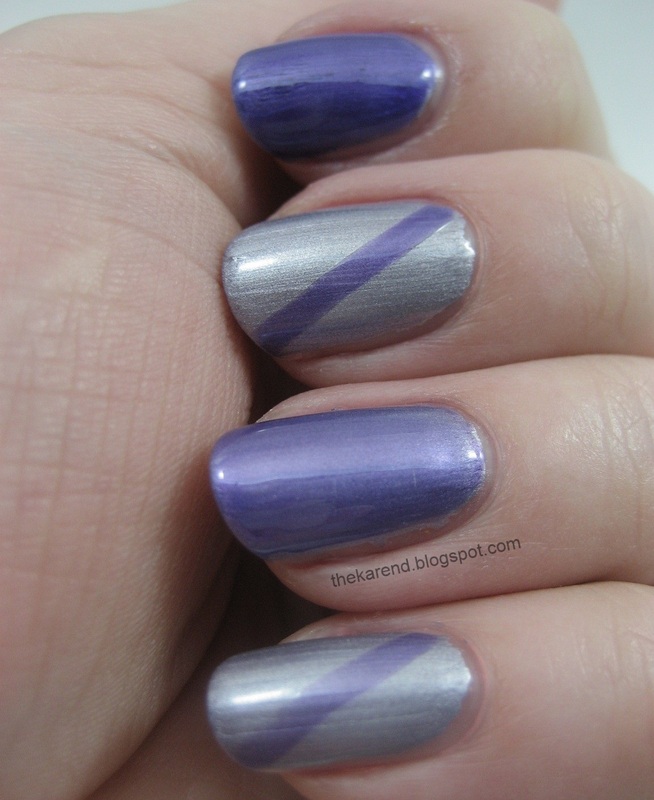 If I'd put the OPI RapidDry on top of my stripes to extend the wear time, they would have disappeared. 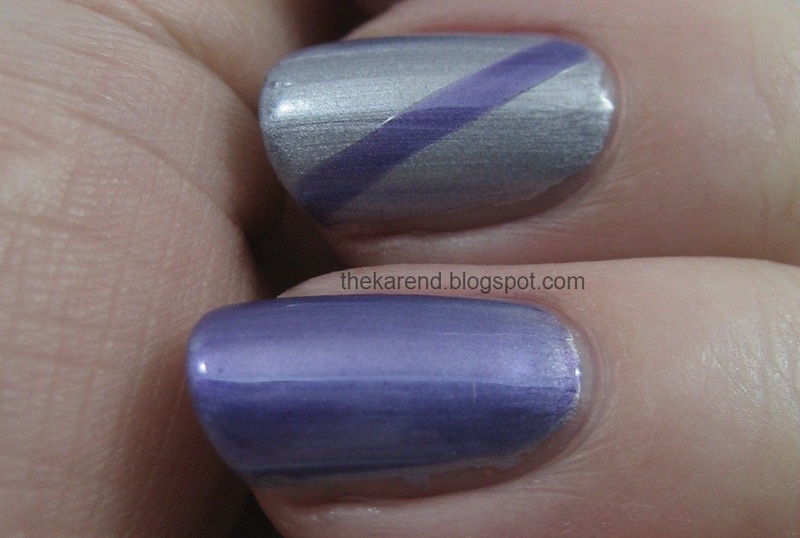 Here are the two solid nails side by side, OPI topcoat on the left, ColorPhase clear on the right. This is definitely a novelty item, but I had enough fun with it that I might go back for a couple other colors. Speaking of other colors of these, entirely coincidentally The PolishAholic swatched one for her entry today. The one she got has a very nice shimmer to it, not at all brushstrokey. Maybe I'll look for that one next time I'm at Rite Aid. we are blog twins today lol! I really love the color this one turned after top coat, I might pick this one up! I like this idea of this, and especially because the "magic" is in the polish and not in the clear thing :) Cool! Amazing thing with this top coat! Very cool! Good way to create some fun nail art fast! Pretty colors. Subtle yet nice. Oh cool, thanks for the swatches and review! That's so cool! I've never seen anything like this! Very cool mani and I love the colors you used! I like the manicure you made! What fun magic, and lovely colors too! This is actually a very pretty color-and I get what you mean by having to be nice and happy for way too long. I'd rather be at my desk and just left alone! Pretty cool polish! I saw these and I thought about picking one up, but I didn't.